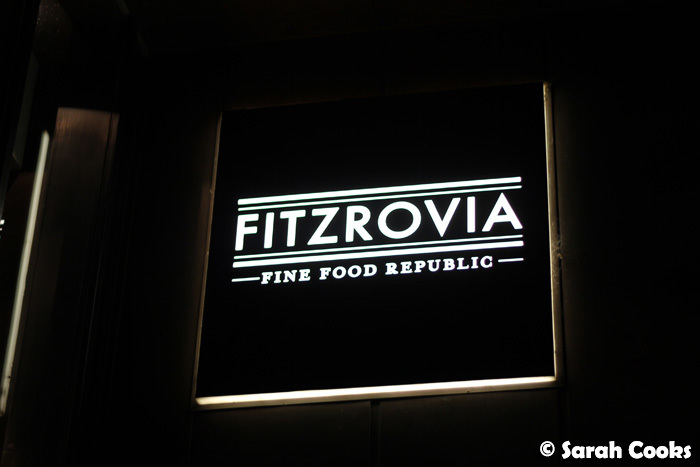 I was recently invited along to try out the dinner menu at Fitzrovia, in Saint Kilda. Having enjoyed chef Paul Jewson's previous venture, Outpost, as well as his cooking at events, I was keen to see what his own restaurant would be like. Located on a relatively quiet stretch of Fitzroy street, Fitzrovia seems to be open pretty much constantly - serving breakfast and coffee, lunch, afternoon nibbles, dinner, and cocktails! The space has a very homey, low-key feel which I love. At street level is the bar and some seating, and going further into the restaurant you'll see that the dining space is separated into distinct rooms, having kept the structure from the building's previous incarnation as a house. My favourite feature is, unsurprisingly, the big open kitchen. 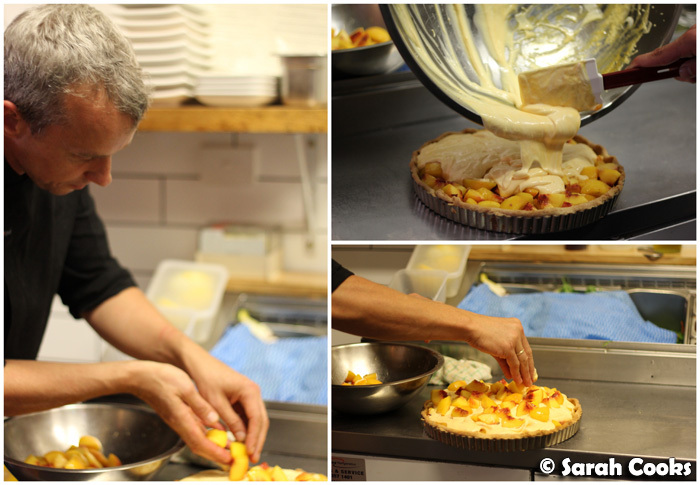 Before we started eating, Paul invited us into the kitchen so we could watch the following nectarine clafoutis tart being made. Mmm... check out all that gorgeous ripe fruit! For blogging purposes, Paul kindly arranged to bring out a selection of items from the menu, doing some in slightly smaller portions than normal so that we could try a larger range of different dishes. 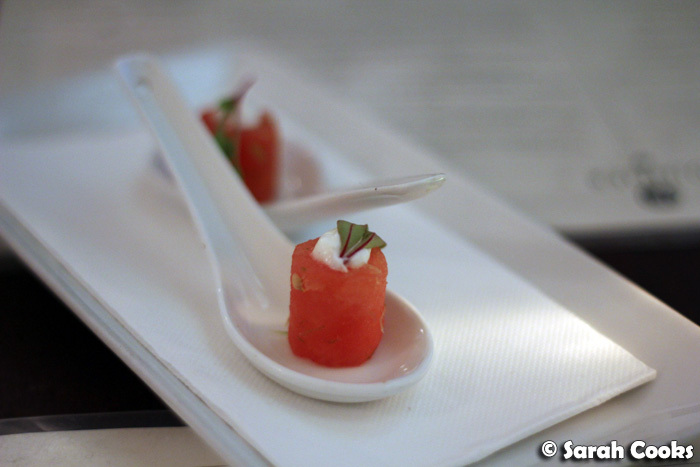 First up, an amuse bouche of lime-marinated watermelon with goats curd and chard cress. With the lime and watermelon flavours, this almost tasted like a cocktail - a refreshing little mouthful to begin proceedings. The first two dishes (brought out together) were Morton Bay bugs and a brawn terrine. As always, I was eating with a non-seafood eater, which meant that I got to have this first dish all to myself! Muahaha! Morton Bay bugs aren't the type of thing I'd think to order myself, but I'm so glad I got to try them - they were fantastic! The bugs were incredibly fresh, and a light prod with a fork removed the tender flesh from the shell. Combined with the gazpacho and a salad of tomatoes, red onion and cucumber, this was a wonderful dish. 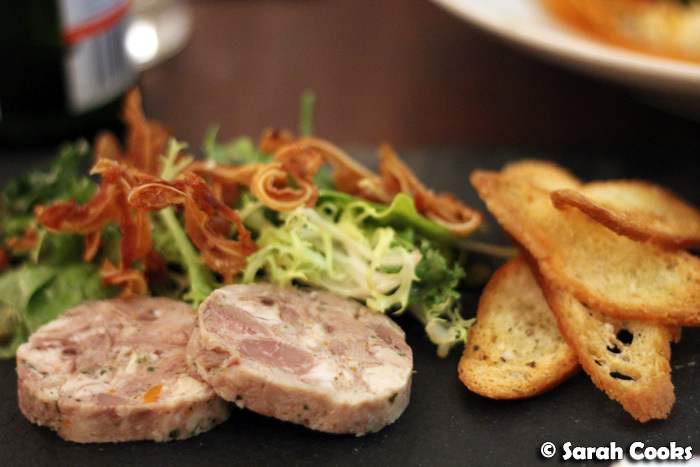 I enjoy all sorts of terrines, pâtés and rillettes, and this was a great version, with the crunchy croutons and crisp pig's ear strips providing a pleasing textural contrast. 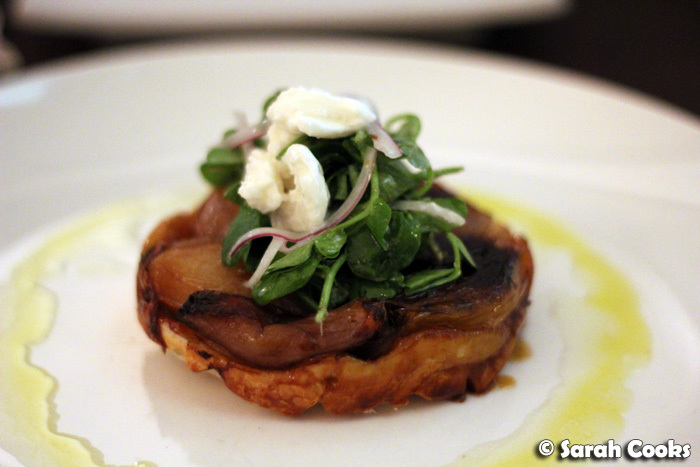 I thought the presentation of shallot tart tatin was really cute! With whole shallots nestled into the puff pastry, I was afraid it would be a bit strong, but the flavour was mellow and sweet. Next came two pasta dishes. (N.B. these were prepared in a smaller portion than usual for tasting purposes). 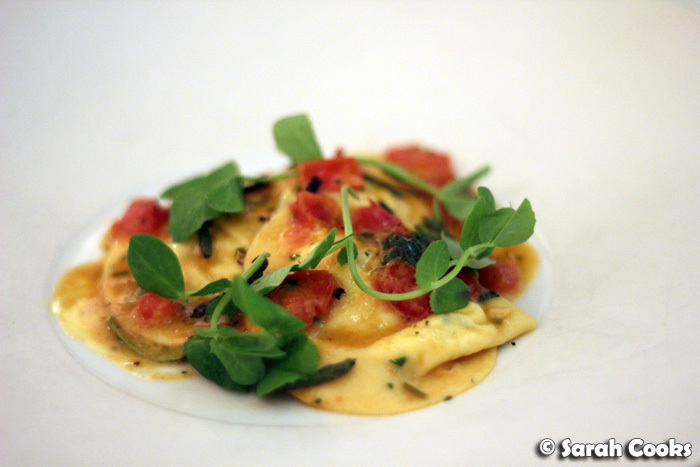 I'd had my eye on the spanner crab ravioli when I saw it on the menu, and was super-happy when it was brought out. I loved the silky pasta, and the mild, delicate flavours of the tomatoes and samphire. I'll definitely be ordering this the next time I visit! 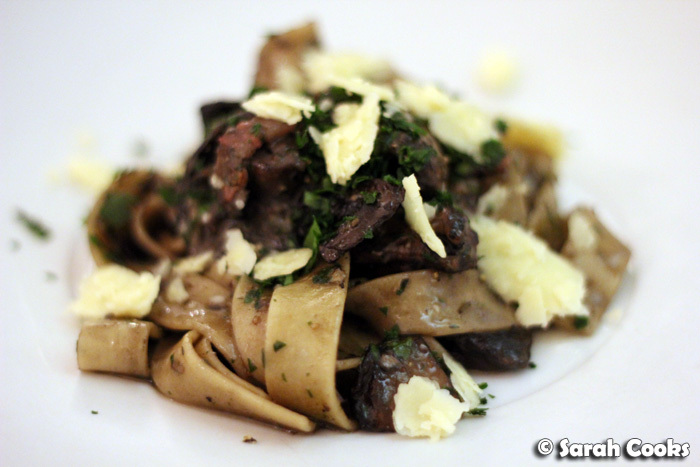 Whilst there were some great elements in the mushroom pasta, the flavours were very intense, so much so that the overall effect was too heavy for my liking. It's lucky that we got this in a small portion - due to its richness, I would struggle to eat this as a main, or even an entree-sized dish, and would have hated to see any mushrooms, truffle oil or guanciale go to waste! And now, the vegetarian option. 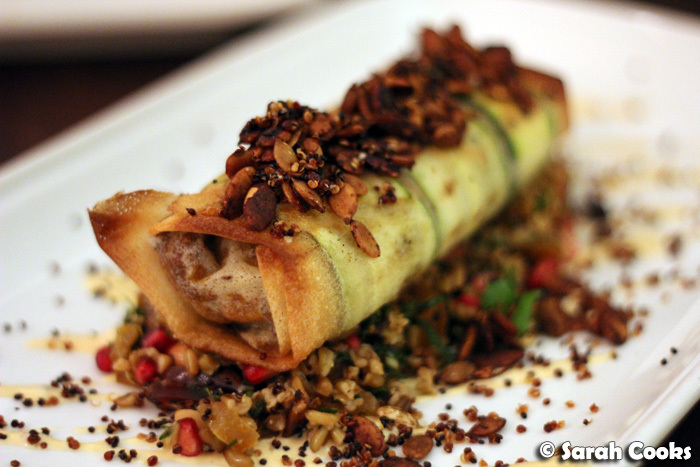 There was so much going on in this dish - in a good way! The taboulleh had a mixture of crunch from seeds (pumpkin, sunflower and poppy), freekah and almonds; with bursts of sweetness from pomegranate, dates, sultanas and dried apricot; and the freshness of mint and coriander leaves. The log in the centre comprised softly roasted pumpkin, wrapped in roast slices of zucchini and wafer-thin, crisp briq pastry. The spiced pumpkin seed mixture placed on top provided a combo of crunch and an earthy spiciness that wouldn't be out of place as a fab bar snack. And (finally!) all the elements were tied together with a nice heat from the chipotle labna that was zigzagged across the plate. Phew! I'm not vegetarian (clearly! ), but I think it's great that so much thought and effort has gone into creating an exciting vegetable dish that is satisfyingly substantial, but not in the least bit stodgy. 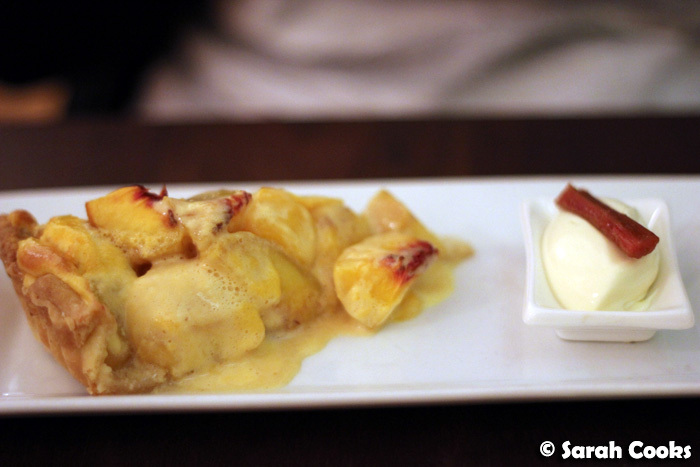 Of course, we had to order that nectarine clafoutis tart. I'm sure that sharing one slice would have been just perfect as a dessert, but I couldn't go past "Adam's ballistic baked cheesecake" when I saw it on the menu, so we asked if we could have a teensy-tiny slice of each one. The name doesn't lie; this was a serious cheesecake. 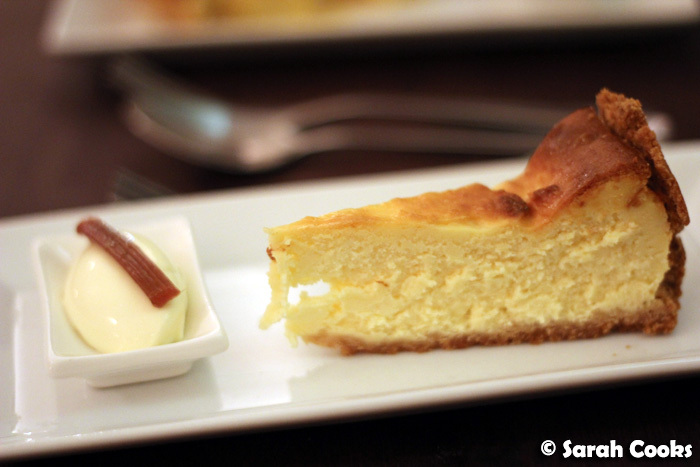 Very rich, very dense, and with no added fruit or other flavourings to distract from the cake itself, this is a cheesecake for true cheesecake lovers. The clafoutis tart was, as expected, fabulous. I don't think you can go wrong with an abundance of fresh fruit, especially when combined with warm custard and pastry. 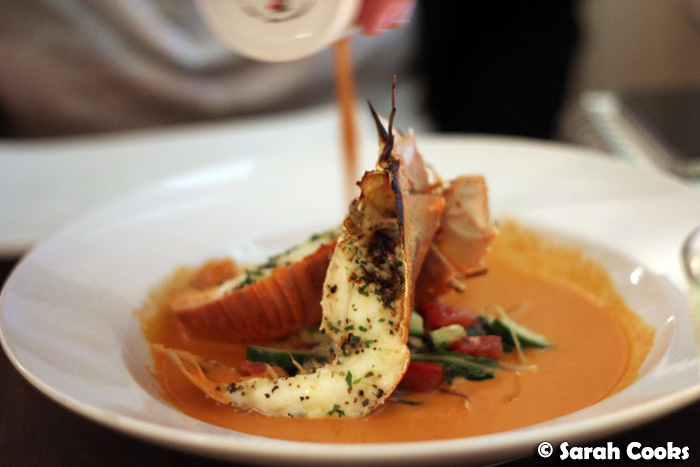 I loved Paul's approach of carefully crafted yet simple dishes, served generously and in a pleasant atmosphere. 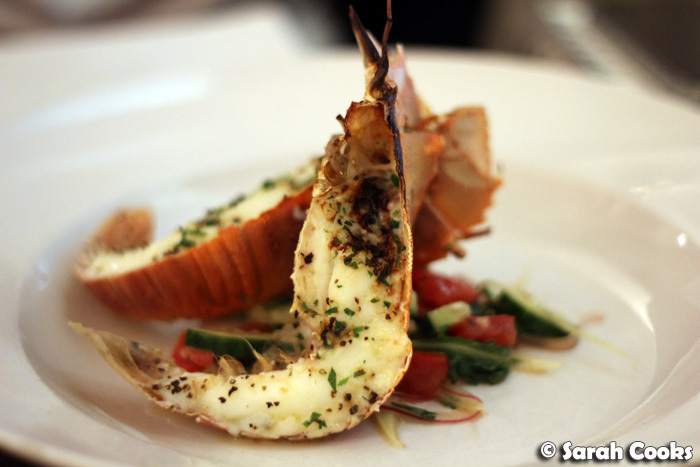 His particular strength, however, appears to be with seafood, and I'd absolutely recommend any of his seafood dishes! A big thanks to Paul Jewson for a lovely dinner and for guiding us through the menu! 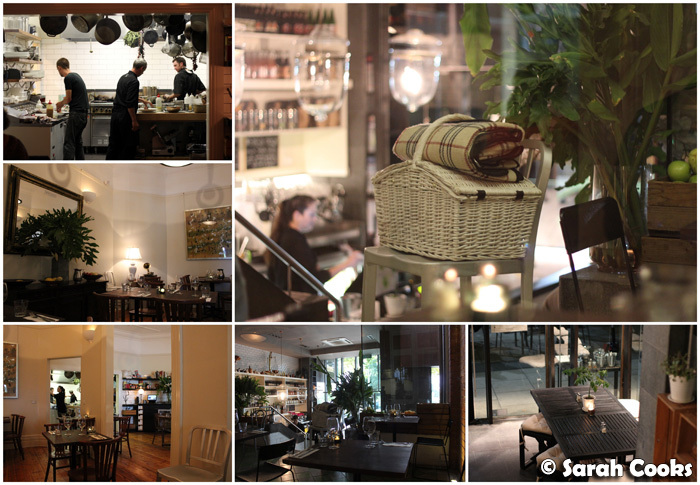 Sarah and Sandra dined as guests of Fitzrovia. Anonymous - the green leaves are snow pea sprouts, the pieces of samphire are the dark green strips underneath.